Do you have a GM car from 1980 – 1995? If so, there is a big chance that you have the OBD1 connector (ALDL). This connector is unique and applies to Pontiac, Chevrolet, GMC, Oldsmobile, Cadillac, and Buick. The good thing if you have this connector, is that you can read you trouble codes at home without any diagnostic tools. There are special diagnostics tools for this kind of connector, but it is not necessary as you will read them as good without a tool. If you have a newer car and need an OBD2 diagnostic tool you can check our other articles. OBD2 codes list. The connector is usually located under your steering wheel, under the dash. The connector may have a black plastic cover over it and you may have to remove some covers to reach it. The connector is often black and has 12 pins on it, pretty easy to identify. 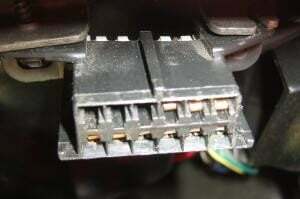 The OBD1 connector has 12 pins, but not all are used on the most cars. The standard pins like the ground, power, a diagnostic pin is the same between a lot of different car manufacturers. Make sure you connect your wires right, as if you are not careful, it may result in damages to your vehicles electrical system and control units. Our method to read the codes without a diagnostic tool is to make a “short” between pin A and pin B. The car will then enter the diagnostic mode and will flash the “Check engine Light” several times and we should count the flashes to see the diagnostic codes. Always connect a car battery charger to your car when doing any electrical works that require the ignition on. Low voltage can cause a lot of trouble with the troubleshooting and a lot of error codes that we do not want. Put a jumper wire between PIN A and PIN B. 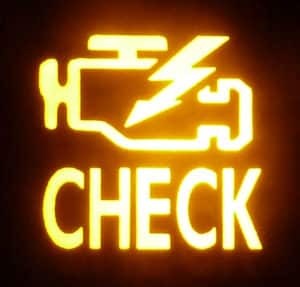 The Check engine light will begin to flash. Count the flashes. There will be a longer pause between the codes if you have several trouble codes and a shorter pause between the digits of the trouble codes. For example code 16 = 1 flash * Pause * 6 flashes. When all trouble codes are outputted, it will flash the code 12 – 1 flash * Pause * 2 flashes. Write down all the trouble codes numbers you got and check the trouble code table further down in the article. Remove the jumper wire and car battery charger. There are also a lot of OBD1 code readers on the market to make the job simpler. With a code scanner, you do not have to short the connector and you do not have to count the flashes on the dashboard. 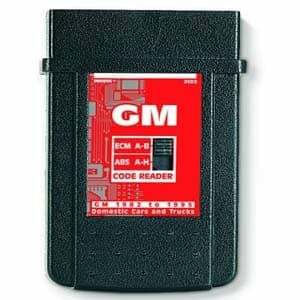 You will get the problem in clear text on your device and this is, of course, a great investment to do if you are reading a lot of trouble codes from older vehicles. Here is a list of what the OBD1 codes mean. The meanings of the OBD1 codes can differ a bit depending on what car model you have, but the most of them are the same among all car manufacturers. OBD1 codes can be a bit confusing and not as good precision as OBD2 codes. But you will get a hint of where to start your troubleshooting. Always connect a car battery charger when you are working with your vehicle. If you have any questions that did not get answered in this article, comment down below. If you have other car questions check our other articles or ask us a question at our home page. What is the definition or meaning of sensor signal out of range? And what would be the best way to fix the problem and clear the codes? -any and all info will help! Please. And thank you. The engine control unit has a range of the signal from example 1-5 volts at the certain temperature / speed. If the sensor is sending a signal out of that range, a trouble code would be set. This could be caused by a faulty sensor, faulty wirings or a faulty ECM (Rare). It can also occur due to low voltage and bad ground. I would start with measuring the temperature sensor and make sure it has the right resistance for the temperature. You can normally find a temperature chart in the repair manual. You can also remove the trouble codes and see if they’re coming back! Hi. I am pleased to find your trouble code site. Thank you. My name is also Joshua. I own a 90′ GMC. 5.7L. Can you confirm that the codes are shown through the “RED -BRAKE LIGHT” flashing? any reasons why this is happening? Hello, thanks for making this web page, it really helps. I have identified my error code as a code 36, “ignition system circuit error”. So what exactly does that mean? Missing 12v on a specific input pin on a electric device? Where do I start looking? My vehicle is a 1995 Winnebago Itasca Sunrise, 7.4L TBI engine. This is my home and I’ve had this error since I got the unit a year ago. Seems to run ok, maybe a little rich. Any help would be greatly appreciated. I’m a pretty good mechanic, just not a lot of experience on a chevy 7.4L. Did not not flash any thing. Also tells me to upshift in park lol. All of it is confusing, I think I have a pcm issue. It may be a problem with the transmission control unit or a speed sensor/shift lever. To me it sounds like that the Transmission control unit does not get any speed information and therefore thinks it speeding while staying in park. 94 caprice 4.3L V8. OBD1 trouble codes can not be extracted. I jumper A and B top right ports and turn key on then the Fans turn on to high and no check engine light flashing. Also this car is known for when giving hard acceleration it kicks on check engine light along with both cooling fans on high speed. After this happens you can pull over and turn car off, start it back up and all is fine until the next hard acceleration. Would anyone have an idea as to what’s going on? If the cooling fans are starting suddenly, there might be a problem with a coolant sensor. Did you tried with an OBD1 scanner like the INNOVA 3123? Check all power wires and ground to the engine control unit.